Just How Bad is Public Debt in Africa? Well, public debt in African states is much higher if you take into account their revenue mobilization capacities. The bigger the informal sector, the lower the debt/revenues ratio. Nigeria’s accumulated government debt is just 18.6 per cent of its annual economic output, one of the lowest levels in the world, implying that its debt burden is more than manageable. But is this a fair reflection of reality? Using a different metric, the Nigerian government’s gross debt is 320 per cent of its annual revenues, according to figures from Fitch Ratings, one of the highest figures in the world and comfortably above the median of 196 per cent for countries in Africa and the Middle East that are rated by Fitch. Martin Wepukhulu is a small-holder farmer in Trans Nzoia County, popularly described as Kenya’s breadbasket. To produce a two-kilogramme tin of maize known as gorogoro here, he spends about Sh25 on land preparation, seeds and fertilisers on his one-acre farm. Some 270 kilometre away in Turkana County, one of Kenya’s poorest counties, is Loseny Nguono, a goat keeper, with two wives and 13 children. Turkana is one of the 23 counties affected by drought which has left close to 4 million people in danger of starvation. Loseny receives Sh8,000 after every two months from the national government through the national safety net programme. He is willing to pay Martin a decent Sh70 for his gorogoro of maize. Unfortunately, neither Martin nor Loseny will get his wish. A reclusive government, ruthless cartels, dilapidated roads and marauding bandits conspire to ensure that while Martin sells his cereals at a low of Sh40, Loseny buys it at a high of Sh150. It is great that Loseny has cash; and that unconditional cash transfers for social protection are increasingly becoming a mainstream policy option (notice that the story doesn’t even acknowledge the awesomeness of this reality). But the other lesson that we can learn from the story is that in order to get Loseny out of poverty we need good roads, properly functioning markets, and security. All these are public goods that must be provided through collective action, above and beyond the improvements in Loseny’s private consumption. For instance, I love most of the exciting micro work in development economics, but would certainly be interested in reading more books or papers covering big picture macro topics in developing countries. I also realize that economists from developing countries are the best-placed (in terms of incentives and access to information) to try and answer some of the big picture questions that do not always lend themselves to empirical analyses. The editors also emphasize the increasing focus on methods in the field of development economics, rather than theory and history (in line with my own observation). The editors argue that the field has developed into a tool-driven profession, where the tools determine the types of questions that are possible to ask as well as the type of analysis possible to carry out. For example, as pointed out by Viner (1937), increasing returns was removed from international trade theory because it was not compatible with equilibrium. As Paul Krugman (1991) puts it: Economics came to “follow the line of least mathematical resistance”. The editors also find that the basic fact of uneven development tends to be reduced to models of “dualism,” which implies less attention to the differentiation internal to sectors, and patterns of interaction of different groups of classes within and across sectors. Furthermore, when it is discovered that certain institutions are different from “the norm” in developing countries, they are highlighted and explained using the same basic analytical tools developed for the norm. This type of Economics is what the editors call a National Geographic view of the broader process of development, as only snapshots of particular institutions or economic activities are separated for the analysis. A brilliant selection. Deaton works closely with numbers, and his preferred topics are consumption, poverty, and welfare. “Understanding what economic progress really means” I would describe as his core contribution, and analyzing development from the starting point of consumption rather than income is part of his vision. That includes looking at calories, life expectancy, health, and education as part of living standards in a fundamental way. I think of this as a prize about empirics, the importance of economic development, and indirectly a prize about economic history. Think of Deaton as an economist who looks more closely at what poor households consume to get a better sense of their living standards and possible paths for economic development. He truly, deeply understands the implications of economic growth, the benefits of modernity, and political economy. Here is a very good non-technical account of his work on measuring poverty (pdf), one of the best introductions to his thought. Deaton’s book, The Great Escape: Health, Wealth, and the Origins of Inequality is a must read for those interested in development. Some readers of the blog may recall Deaton’s summer square off with Rwanda’s Health Minister Agnes Binagwaho over his comments on the Boston Review blog. Deaton’s selection is a timely nod to the study of BIG PICTURE development. This paper examines the extent to which locally informed intermediaries can be exploited and provided with incentives to change the health-seeking behavior of pregnant women in rural Kenya. Despite Kenya being the largest and most advanced economy of East Africa, maternal and infant health outcomes are typical for those of other sub-Saharan countries, which lag significantly behind the developed world. There is evidence that antenatal care (ANC) is associated with improved maternal health outcomes, yet the majority of women in rural Kenya fail to meet recommendations for ANC timing and use, despite the availability of government subsidized healthcare. I examine whether a local intermediary, whose own incentives might oppose those of the government, can be co-opted to assist the government’s objective of increasing women’s ANC utilization. I use a randomized controlled trial (RCT) to evaluate a program, which provides financial incentives for TBAs to encourage pregnant women to seek ANC at a formal medical facility. Competition between the TBAs and the formal clinics makes the effect of the program an empirical question, as there is no guarantee that the TBAs will respond to the incentive. I find that living in a TBA treatment village increases the likelihood of attending the recommended number of visits by 20.7%. Women living in TBA treatment villages are 4.4 percentage points more likely to attend the recommended number of visits than women living in control villages, who attend the recommended number of visits 21.3% of the time. The results of this experiment, the first to study the extent to which TBAs can be motivated to encourage women to attend the prenatal clinic, could have important policy implications. The program’s success suggests that despite having a risk of losing clients, TBAs can be utilized as intermediaries of health facilities. Furthermore, finding that TBAs can induce pregnant women to attend ANC visits indicates that cultural norms, which discourage women going to ANC visits, can be overcome with relatively small financial incentives. By increasing the demand for formal maternal healthcare, TBAs’ encouragement of ANC attendance by women may help achieve improved maternal and child health outcomes. That’s Georgetown’s Nisha Rai, in an excellent paper on the possibilities of integrating the use of traditional birth attendants with the formal healthcare system in Kenya (and developing countries in general). You can find a summary of the paper at the Bank’s Development Impact blog here. If you know a policymaker in the health ministry of a developing country, please have them read this paper. The book is not however good economic history. It is an example of Whig history in which good policies make for progress and bad policies preclude it. Only transitions from bad to good are considered in this colorful but still monotonic story. The clear implication is that if countries can copy the policies of English-speaking countries, they will prosper. No consideration is given to Britain’s economic problems over the past half-century or of Australia’s relative decline for a century. That is Peter Temin writing about the story of Economic History at MIT in the 20th century. For more click here (H/T Greg Mankiw). Also, to be honest, one of the reasons I am into development (and the politics around it) is because of my fascination with economic history. I wish more development practitioners and theorists alike cared a little bit more about economic history. At the very least, looking at how things really actually worked out in the past serves to temper the urge to completely fall for the latest fad within the development industry. 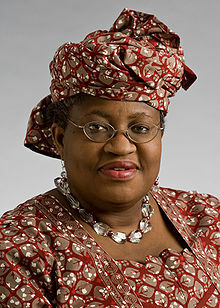 Nigerian Ngozi Okonjo-Iweala is definitely the dream candidate for the Bank. But the realities of U.S. domestic politics and foreign policy concerns are stacked against her nomination to the presidency of the Bank. It will be hard for the U.S. to selflessly relinquish an important tool of foreign policy and influence in the Bank’s presidency. If Obama backs down, he will be criticized for being soft in the face of international pressure. If he nominates a non-American, he will still be criticized as an apologist for those who hate America (real or imagined) and a believer in American decline. 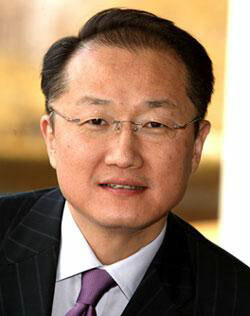 Obama’s incentive is to get his nominee become World Bank President. Full stop. So far those rooting for Ngozi (including yours truly) have questioned Jim Yong Kim’s credibility (he is/was not a fan of neo-liberalism) and competence (he is not an Economics PhD; but a mere MD, PhD) as World Bank president. You can get Kim’s co-authored book here (or your local library; $97 is a bit pricey), it is on my to-read list (A review of the book is available here). You don’t have to denigrate Dr. Kim to praise the other candidates. The strongest case is that while Dr. Kim is a good candidate, Dr. Okonjo-Iweala is the dream candidate. She’s from a large developing country, knows the issue well, understands the complex world of global finance, and is intimately familiar with the culture and organization of the Bank. And, for her supporters, the changing nature of the international system has made this practice of the U.S. having the automatic right to appoint the Bank’s president an anachronism. The Economist has joined a string of internet commentators in endorsing Nigerian Minister of Finance to become the next president of the World Bank. Contrasted against the resume of Obama’s choice for the Bank, Ngozi wins. By miles. The World Bank is the world’s premier development institution. Its boss needs experience in government, in economics and in finance (it is a bank, after all). He or she should have a broad record in development, too. Ms Okonjo-Iweala has all these attributes, and Colombia’s José Antonio Ocampo has a couple. By contrast Jim Yong Kim, the American public-health professor whom Barack Obama wants to impose on the bank, has at most one. However, it is interesting that in all the debate no one has talked about HOW Ngozi will change the Bank’s operations, besides insinuations that she has hands on experience in transforming Nigeria’s public finances, coupled with her previous experience at the Bank. More importantly, what would be the cost to Nigeria if they lose Ngozi? Is this important at all? Ngozi leading the bank will probably make a difference. However, I think that support for her candidacy has thus far been too one-sided. Nigeria, like much of the developing world, does not have much influence on the Bank’s board. Nigeria also stands to lose one of its ablest technocrats just when it is striving to reform its public finances. These considerations should matter too, I think. Just for the record, I am one of those who think that it would be really cool to have Ngozi lead the Bank (despite the fact that she probably will not). Update: I just came across some interesting thoughts on Ngozi’s nomination over at Africa is A Country (H/T Chad). Starting with schooling outcomes, we find that although dropout rates declined in both treatment arms, the effect in the UCT arm is 43% as large as that in the CCT arm. Evidence from school ledgers for students enrolled in school also suggests that the fraction of days attended in the CCT arm is higher than the UCT arm. Using independently administered tests of cognitive ability, mathematics, and English reading comprehension, we find that although achievement is significantly improved in all three tests in the CCT arm compared with the control group, no such gains are detectable in the UCT arm. The difference in program impacts between the two treatment arms is significant at the 90% confidence level for English reading comprehension. In summary, the CCT arm had a significant edge in terms of schooling outcomes over the UCT arm: a large gain in enrollment and a modest yet significant advantage in learning. When we turn to examine marriage and pregnancy rates, however, unconditional transfers dominate. The likelihood of be- ing ever pregnant and ever married were 27% and 44% lower in the UCT arm than in the control group at the end of the 2-year intervention, respectively, whereas program impacts on these two outcomes were small and statistically insignificant in the CCT arm. ……….. Our findings show that UCTs can improve im- portant outcomes among such households even though they might be much less effective than CCTs in achieving the desired behav- ior change. QED. There you go. An indie folk proof for rational preferences. Rodrik has a finding that reinforces the importance of politics and other macro conditions for economic development. He points out the existence of the paradox of unconditional convergence at the industry level but not at the national level. Rodrik stresses the importance of structural change that channels labor into the right industries. To this we should add political change that provides certainty and the requisite legal and physical infrastructure for economic growth. Industries that thrive in poorly run places – like telecoms, banks and construction firms in Nigeria or Kenya’s retail giants – do so despite their governments. Non-existent roads, underdeveloped railway systems, sporadic and expensive electricity, bad schools, legal uncertainty and massive amounts of political risk all serve to limit the extent to which within-industry gains can be extended to other sectors. The massive uptake of mobile telephones across Africa suggests that consumerism in SSA is alive and well, just under-exploited. Sectors like textiles, agriculture and construction remain largely untouched because of cheap imports and bad regulation. Development is a complex enterprise that requires massive amounts of (implicit) coordination. There has to be a link between California’s Silicon Valley, Massachusets’ Route 128 and New York’s Wall Street, in addition to other growth clusters. In this game synergy is King. The provision of the legal, human capital and physical infrastructure to facilitate coordination of this scale is largely dependent on well-functioning governance structures. Poor countries have access to new technologies already developed elsewhere so should grow more rapidly than richer economies. This is one of the implications of standard growth models, as well as of common sense. But in reality, there is no automatic tendency for economic “convergence” among countries at different levels of income. Convergence depends instead on a number of additional determinants. It is only those developing nations with the “appropriate” preconditions – for example, adequate schooling or physical investment – that manage to absorb new technologies sufficiently rapidly and therefore to catch up. In the language of growth economics, there is conditional convergence, but not unconditional convergence. When we look at the same question at the level of individual industries rather than countries a surprising finding emerges. Suppose we focus on, say, plastics, furniture, or the auto industry in developing countries. Does productivity in these (and other) industries experience automatic convergence with the technological frontier? Or is convergence once again conditional, depending on a host of country-level variables? The interesting (and I think new) finding is that productivity convergence appears to be unconditional at the industry level – at least for manufacturing industries and for the period since the 1980s. I am on record as not being too enthusiastic about “pro-poor growth” as it is currently practiced. Loans to the poor and other approaches that completely bypass those with a higher probability of succeeding at creating big business – the educated and middle class – will at best only keep the poor afloat and at worst divert resources from much needed long-term investment. I am not saying that the educated have a monopoly on entrepreneurship. All I am saying is that what we want is to create sustainable jobs. This requires scale. And scale comes with big business and industry. The difference between a country with $1,500 and $15,000 of income a head a head is simple: industry. All the microfinance and microenterprise programs in the world are not going to build large firms and import technology and provide most people with what they really want: a stable job, regular wages, and a decent work environment. OK, I have to admit, I am one of those who read “The Road to Serfdom” and totally loved it. Hayek was spot on about the folly of planned economies. The markets are not perfect. But having imperfect markets beats planned economies on any day. We just have to provide a reasonable amount of regulation and provide social safety nets that take care of those who end up taking one for the team because of the dynamics of the free market. And that is why I thought this post by Easterly was kind of neat. Happy New Year to all of you out there. Let’s start off the year by looking at the one thing that the Continent needs really badly: economic growth. Uganda’s New Vision reports that African business people have positive expectations for the new year. Responding to a survey by Africa Practice most of them believed that intra-continental trade as well as FDI would increase in the coming year. Perhaps most crucially, a plurality of those polled believed that infrastructure development – ICT and what not – would be more influential to business development than politics. For a very long time Africa’s governance challenges have retarded economic development. May be economic development might be the key that will incentivise good governance. Angola, Namibia and Kenya, to some extent, are the countries that may prove this prediction right in 2010. 2010 will also be a footballing year for the Continent. From January 10 – 31 Angola will host the 27th edition of the Africa Cup of Nations (CAN). May the best team win, and I hope none of the Continental heavyweights will pick up injuries because come June South Africa is hosting the FIFA World Cup. The Continent has good teams in the World Cup and this might just be the year that an African team wins the coveted FIFA World Cup Trophy. And in other news, South African president – Jacob Zuma – just got married for the fifth time and is engaged to at least one other woman. I still stand by my previous comments on this matter.